As I was such a glorious day, I re-took one of my favourite views of the basilicas. Here is one of the chapels inside. To be frank, I think that the average B&Q warehouse is more attractive. I drafted that post earlier. This afternoon, in the space of less than half an hour, the weather suddenly changed and there was a violent hailstorm for about five minutes. Unfortunately, it washed out the Blessed Sacrament procession and when it dried up a litle, everyone headed straight to the underground basilica. I'll see if I can get some photos tomorrow. After seeing a couple of comments, I need to add here that St Bernadette's incorrupt body is kept at the Convent at Nevers. 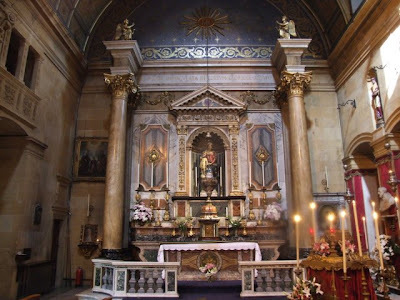 The reliquary under the altar in the photograph just contains some relics, not her whole body. I wanted to take some photographs at the International Mass today so I said Mass just after 7am in one of the little chapels off the Crypt Chapel. 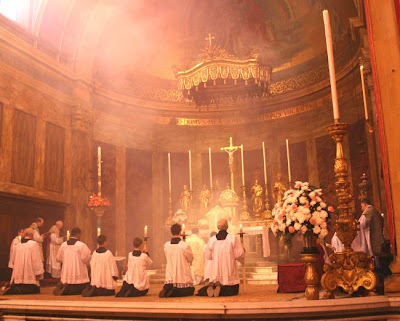 It is worth mentioning again for priests that you can walk into the Sacristy there at any time of the day and they will set you up for a private Mass. If you have a small group (less than, say, 10 people), you can bring them with you. Our Mass this morning was at 8am in the Crypt chapel, the first to be built and the only one to be visited by St Bernadette herself. The relics of St Bernadette used to be housed here in one of the side chapels. This meant that people at Mass were often distracted by people shuffling round to venerate the relics. They have been moved now: I’m not sure where and I intend to find out. This is one of the many small practical improvements made by the Shrine authorities. Mass in the Crypt Chapel is now uninterrupted and the addition of an extra pair of glass doors in the corridor leading to the chapel means that it is much quieter than before. 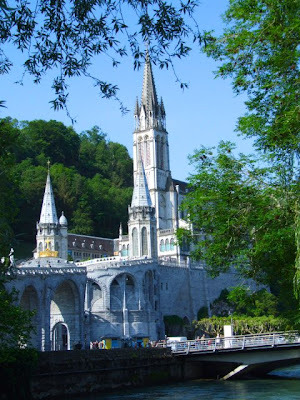 Although it is always a delight to visit Lourdes, the liturgy is not exactly "classical" in style. The music can be particularly awful at times. This is not entirely the fault of the French. I heard some soupy crooning coming up from the Pius X Basilica this morning at Mass for a large English group. In the Pilgrimage booklet this year, there is special hymn to be sung at the International Mass in accordance with this year's theme. It is a jaunty song in 3/4 with the words "Penance, penance, holy penance for the Kingdom of God is close at hand!" It has been translated from the French without regard to the stress in the English sentence so that the last phrase goes "is close AT hand." 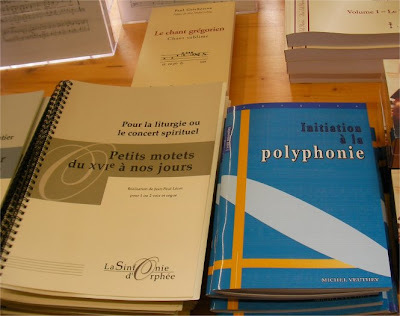 I was therefore intrigued to see the welcome sight of these books in the French section of the official shrine bookshop. 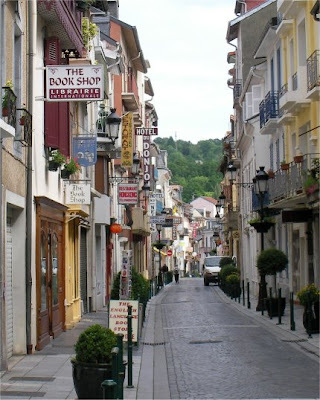 One of the most interesting streets in the town above the Domaine in Lourdes is the Rue du Bourg which cuts across from the Rue de la Grotte almost to the Boulevard de la Grotte. At the southern end, there is a shop with antiquarian books including some devotional books in French from the early 20th century and one or two from the 19th century. On the same side a few yards further along there is the English bookshop which is always worth a visit. A little further along and across the road is the Pro Life Centre, one of the Permanences – permanent establishments each a with particular pastoral focus. From there I went to visit the lovely parish Church. Tomorrow promises to be a sunny day so if that turns out to be the case, I will go round with the big camera and take some more photos, particularly of the Church and points of interest around the Domaine. Last evening, surrounded by wires, I counted up the various chargers that I have brought with me. Mobile phone/MDA, laptop, camera batteries, camcorder battery. The camcorder is quite neat – pictured here next to the software CD that came with it. Still photo resolution is up to 10 Megapixels so it will be fine for odd pics here and there. If we have a sunny day this week, I’ll take out the big camera which has a much better lens. Yesterday evening there were intermittent showers. I did what I usually do in Lourdes and bought a cheap umbrella (6 euros). However that didn’t last long. Up on the esplanade, I was taking a couple of clips of the beginning of the torchlight procession when a gust of wind totalled it – metal spike falling off, that sort of thing. The coach journey from Toulouse Airport was a full two hours so we only arrived at the hotel just in time for dinner, followed by a quick check-in and then over to the Domaine. Confession made (absolution received & penance accepted & completed), several large candles lit (paid for first, of course), mortal frame fittingly shocked by dunking in baths (prayers said in Latin), dunking Brancardiers duly blessed, Breviary finished, Grotto visited, rock venerated, ground kissed, water drunk, Rosary Basilica visited... so time for a little blogging. An enquiry earlier at the tourist office opposite the parish Church was rewarded with a list of locations of internet cafés and wifi hotspots. A big "heads up" to the Café Le Carrefour, just round the corner from the Hotel - it has free wifi. Outstanding! Glad I bought the laptop with me. Well that's a relief. No nasty settings intervened to prevent me from getting online at the T-Mobile wifi hotspot in the departure lounge at Gatwick airport. Now I know it works, I'll be looking for wifi places in Lourdes. Jolly useful stuff. Glad to say that I have also found exactly what I was looking for by way of a camcorder. It is very small and only records to an SD card, and will take still photos. It is splashproof so it shouldn't get damamged when I choke on my coffee if I need to video some diocesan group deciding to have Hindu dances at Holy Communion or invoke the name of Allah instead of the Kyrie. YouTube here we come! This year our secular substitute holyday happens to fall on Whit Monday. As it is also the school half-term, it is the occasion for the annual parish Pilgrimage to Lourdes. 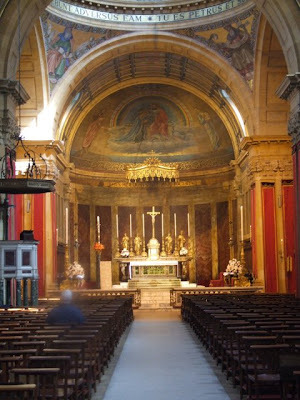 We will have Mass at the Lady Altar first thing followed by the Itinerarium (prayers befoer a journey) and then fly to Toulouse followed by a viewing of Jean Luc Delannoy's excellent film Bernadette on the coach transfer to the Hotel D'Angleterre. I love Lourdes more and more each year and I am really looking forward to tomorrow night's torchlight procession. Once I have got my Catholic Herald article finshed and emailed to the editor, I will pack: it doesn't take me long - I'm a cleric, I travel light and I don't have to worry what colour shirts to bring. 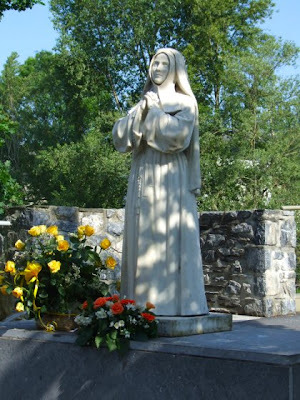 Then I will go to bed happy, knowing that in less than 24 hours I will be praying before the spot where Our Blessed Lady appeared to St Bernadette. Fr Bowden in his Miniature Lives of the Saints says that the life of St Bernadine was St Philip’s favourite among the saints and the last he read before his death. Fr Bouyer on the other hand says that the last book he had read to him was the Fathers of the Desert. Perhaps we should make a distinction between reading or being read to; or perhaps St Philip inspired the two fathers with different information as a joke. The students would go to see St Philip to obtain his blessing before their return to England and, for many of them, death for the faith. Last night we had traditional solemn Vespers with four pluvialists (cantors wearing copes) followed by solemn Benediction. One seminarian from Oscott who came thanked the Fathers afterwards for the opportunity to participate in the "Bible service with Hymns" - an excellent example of seminary wit! Jackie Parkes (Catholic Mom of 10) hosted a bloggers' meeting in Birmingham that ended up as an impromotu Catholic family day. 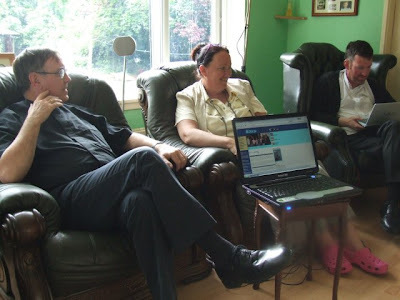 Pictured above are Fr Sean Coyle, editor of Misyon Online (left) , Jackie and Fr Gerry. Fr Guy came along later as did another family and my sister, Jane ,with some of her children; including Damien so that we could have a "Dominus vobiscum" session. Matt Doyle, Maddie's father, was also there and has posted on the meeting over at Lacrimarum Valle. "The future of humanity passes by way of the family" and "there is no more efficient way for the rebirth of the society than its rebirth through healthy families" that are faithful to their conjugal and parental vocations. The Fathers have very kindly invited me to preach at the Birmingham Oratory for the Feast of St Philip Neri on Saturday. I will be travelling up to Birmingham tomorrow and meeting first at the house of Catholic Mom of 10 where Matt Doyle is going to join us with Wendy and Maddie. I was going to say something frivolous and rude about the architecture in Birmingham but reflected that my first view of it is generally New Street Station and environs which is perhaps not entirely representative. In any case, I have already offended Man-U fans and it would be silly to alienate the whole of Birmingham as well. So I point you instead to Matt's post on Birmingham Architecture. In fact, I have no reason to be superior since I will be leaving from the equally ghastly Euston Station. I might take some pictures of it just for a laugh. I received notice today from Aid to the Church in Need UK of two forthcoming events that I recommend highly. Mass celebrated by Bishop Arthur Roche in St Anne's Cathedral. Talks afterwards. As a Lebanese priest, Fr Samer has had to witness an exodus from his homeland as the people fled from the tragedy of conflict. With tensions in the Middle East at boiling point, the Lebanese Church is once again facing a crisis. Fr Samer examines how the Church is bringing the hope of a brighter future to a flock that has been the innocent victim of violence, political instability and the rise of militant Islam. He asks what the future hold for the Faith in the lands of the Bible, where extremism and fear reign. Every week, there are dozens of breathless new ideas about how to make use of the internet. Now and again, there is a real gem with tremendous potential. I believe that Library Thing is just such an idea. Type in a few words from the title of a book in the search box and hit "Enter". The site searches Amazon and the Library of Congress catalogue as well as others. You then select the item which matches the book on your shelf and it is added to your "Library". All the details are included - author, title, date, publisher ISBN etc. It is amazing how quickly it is possible to catalogue a dozen or so books. You can export your "Library" to a file, import from other files, put a widget on your blog etc. The service is free for 200 books and after that it is $10 per year or $25 life membership. 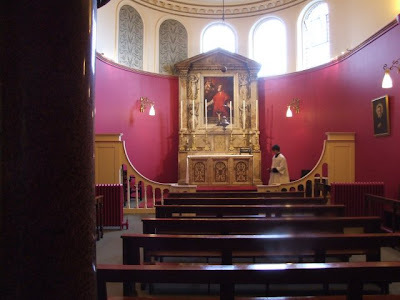 I thought I would pass on to you (with permission) this comment I received the other day by email from a parishioner:I attended last Thursdays traditional latin mass which was a first for me. I must admit I had thought I wouldn't really enjoy it,as it seemed a strange and exclusive concept with the priest having his back to the congregation. I couldn't have been more wrong. It was wonderful and very surprisingly I found my concentration and spiritual contribution was far more intense than the normal mass, where at times my imagination takes me away from the celebration, despite my resolution that it will not. I think that because the mass is in latin and because there is far less 'activity', the atmosphere is such that distractions are very minimal. Many thanks for introducing me to this tradition. Pope John Paul taught us that loving the family means identifying the dangers and evils that menace it in order to have the knowledge, ability and confidence to overcome them. True optimism is based on realism. The United Kingdom is a nation in an advanced stage of the Culture of Death. Our policies have a pivotal role in the attack on families both in that quarter of the world which shares our Common Law Jurisdiction and in the European Union. As a family doctor of almost 40 years standing and as a founder of an association of families I now wish to highlight three dangers to our families. C Can I have your moble number? P I don't have one. C Can I have your home number? C You are the first one to ask that. Because we might need to contact you.Now this is interesting. The Child Potection Officer for our diocese has advised that Youth Workers should not communicate with young people by mobile phone or text messages because the informal nature of young peoples' use of mobile phones can mean that a wrongly over-familiar personal line of communication is set up. This seems a reasonable precaution to me. Furthermore, schools will not even release under-age pupils contact details to the police without the parents consent. C What do you want to do? No smoking at the crematorium? Pro Ecclesia et Pontifice has now uploaded a number of talks by Catholic speakers including Archbishop Fulton Sheen, Fr Hugh Thwaites and Daphne McLeod. They are available as free downloads. 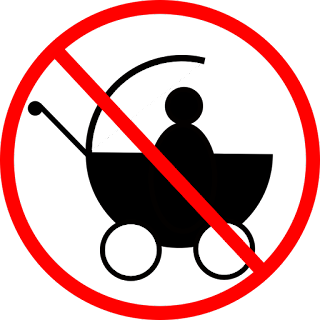 Especially useful if you drive a lot and need something other than mindless radio to listen to. A new blog East Anglia Seminarians by Padraig Hawkins from Cambridge Luke Goymour from Peterborough Michael Collis from Ipswich (pictured left) who (I think) are all studying at St Mary's College, Oscott. 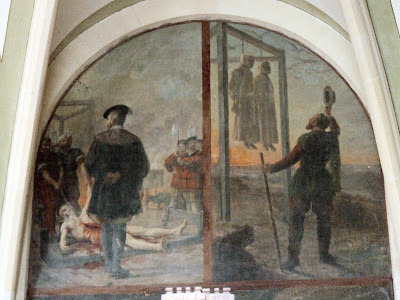 I had a trip to Oscott last month to give a talk on Pro-Life preaching - it is great to see that some of the seminarians joined in with the the Birmingham Oratory's pro-life "Siege of Jericho". Today I enjoyed a tour round the South of England. After driving to Wonersh last night, I joined the community for 7.30am Mass and then spent the morning marking some exams and then going through them with Fr Dingley to check that we were marking fairly. This is a laborious but important task for those students who are taking the BTh degree. A lunchtime drive along the A281 with a detour round Horsham took me to the Carthusian Monastery at Parkminster where I give a class on Sacramental Theology for the novices and simply professed. We nearly finished the section on the sacrament of Holy Orders today and had some good discussion on the question of the episcopate, the form for the ordination of priests (particularly the ICEL translation) and the theology of gender. It is very helpful for me to get a Carthusian perspective on various disputed questions in theology. As usual, I stayed to join the community in choir for Vespers which is a wonderful privilege. The presentation of the English edition of "The Risk of Education", a book by Fr Luigi Giussani, the founder of the Communion and Liberation movement. The speakers at the event will be Fr Julian Carron (Fr Giussani's successor as leader of CL), Dr Peter Hodgson (Senior Research Fellow in Physics, Oxford University) and Prof John Milbank (Professor of Religion, Politics and Ethics, Univ. of Nottingham). In the book, Fr Luigi Giussani describes true education as "one that matches human reality, that is, educating what is human in us, our source or origin". While the book is written with Christian education in mind, the method outlined - of proposing a tradition which is lived out in the present and that can be critically verified personally by the pupil and educator together - is valid for any human experience. The event (open to all) is on Thursday 24 May, 7pm at 1 Great George St, SW1P 3AA. Jackie Parkes has the text of an article by Fr Guy Nichols in the Oratory Bulletin in her post: 'JESUS IS STILL WITH US ' & Mr Tony Blair!. It is an excellent short critique of that hackneyed question "What would Jesus have done?" Mulier Fortis has been digging away at the latest HFEA consultation. They are apparently consulting until 20 July 2007 about whether to allow the creation of human-hybrid embryos for the purposes of experimentation. Fr Z has tagged me with a meme. Well, I'm no literary critic and I don't read much fiction but I'll do my best - here goes, off the top of my head. 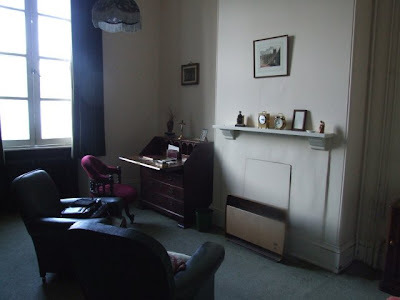 I tag Fr Justin (Nova et Vetera) and Fr Ray Blake (St Mary Magdalen, Brighton). I just realised that the FA Cup Final was today. Completely passed me by, I'm afraid. Chelsea beat Manchester United 1-0 after extra time. As a Palace fan in my youth with Milwall second best (I used to go and watch them when I was in Camberwell) I wouldn't normally want Chelsea to win anything. But I'm glad they beat Man-U. The match was in the new Wembley Stadium. By all accounts, I didn't miss much. Whalley's World of Sport has a six word summary of the match: "DROGBA scored. Chelsea won. Terrible match." An excellent and very encouraging article by Hilary White in Thursday's LifeSite news tells of the power of the blog to fight back against the mainstream media, especially in pro-life matters where we have, over the years, simply become numbed into apathy by the relentless anti-life bias. 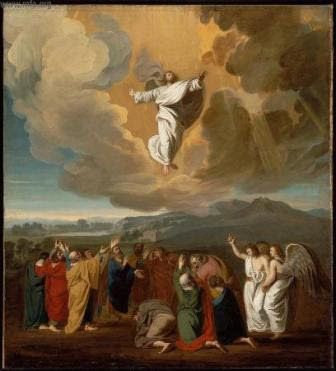 Henry Dietrich posted on the moving of the feast of the Ascension back in 2003 and his post Ascension Sunday? is well worth reading. 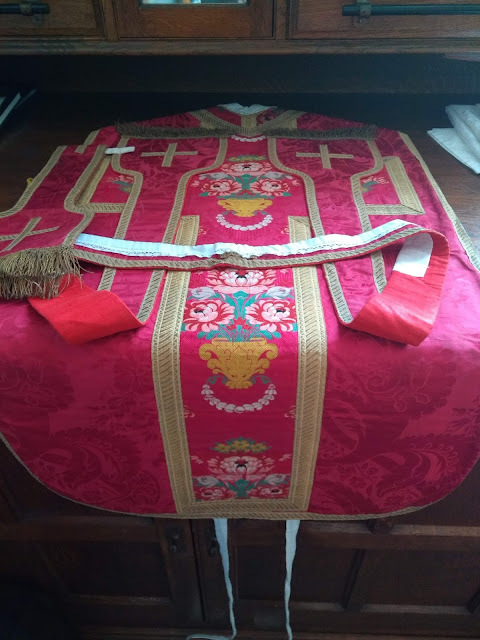 Fr Justin has a new blog Nova et Vetera. In his profile, he says that Fr Justin is not his real name but a way of being able to say what he really wants to. He has a post today "The Reign of Terroir" in which he explains his distaste for New World Chardonnay. He also explains how to make it:Now, if you like New World Chardonnay (and why not? some people even like Harvey's Bristol Cream), you can make your own. Take one bottle (or more) of white wine. Use a chardonnay grape if you like, but it won't make much difference by the end. Uncork it, and leave it in the garage for five years or so. Now, brush off the cobwebs, and pour all the wine into a large saucepan. Reduce it by half. Add several large spoons of golden syrup. If the resultant mixture is too gloopy, you could always top it up with water, I suppose. The colour should be like old urine. Now, export it to the French and see what they say. At Blackfen this evening, we had a Low Mass in the Classical Roman Rite to celebrate the feast of the Ascension. 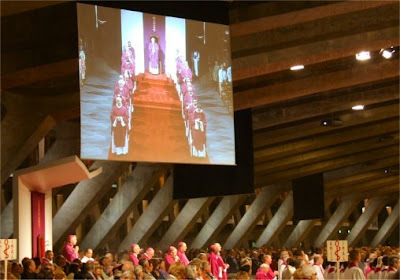 (I'll also be celebrating the Novus Ordo on Sunday for the same feast.) For two young lads in my parish, this was their first chance to serve the Mass after lots of practice with me - they did a great job. They need a little more practice with the responses at the foot of the altar but they managed to get through them and serve the whole Mass with great reverence and enthusiasm. We had a good congregation of families and individuals from the parish, people from the Deanery Pastoral Council, and the Latin Mass Society. I reflected on the beauty of being able to celebrate the traditional Mass as something for the parish and the deanery together with those who have stuck to it through difficult times. Birmingham Oratory's "Siege of Jericho"
"The Church is our home"
Alternative sources for "After Asceticism"
Saint Philomena - pray for us! Met Fr Z at last!